All ion beams that can be produced by any of the two RBI accelerators can be directed into the RBI dual beam irradiation chamber. 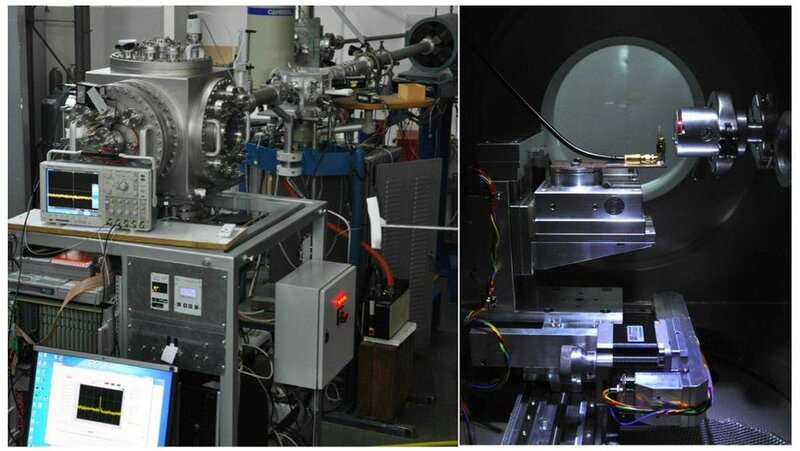 The chamber is originally developed for dual beam irradiation of fusion materials (DiFU), but can be used for irradiation of wide range of other sample types using wide range of ion beams. The ion beams (mm sized cross sections) from two accelerators are entering the chamber under the 20 degree angle. Beams are scanned over the sample surface up to the area of 30 x 30 mm2. Sample temperature (during irradiation) can be controlled up to 600 degrees C. In order to enable irradiation of materials/samples having different geometries, working principles and purposes, this scattering chamber is of fairly large dimensions (40 cm cube). Each of the ion beams can pass through the rotating beam degrader in order to homogenize the irradiation over larger sample depths. The automatic retractable Faraday cups are used to monitor the beam current stability and fluence. Alternatively, the indirect fluence measurement techniques (PIXE, RBS, etc.) can be also used.